Does it seem like skin and food allergies are becoming more common among children? If you say yes, then you may be right according to a recent government survey. According to a recent survey by the CDC, about 1 in 20 children in the U.S. now have food allergies. That’s compared to a 50 percent increase from the late 1990’s. And 1 in 8 children have eczema or another skin allergies, which is an increase from 69 percent. However, according to CDC researchers, no increase was found regarding hay fever or other respiratory allergies. The numbers aren’t precise, the CDC says. The report relied on parent reporting in years 1997-1999 and 2009-2011. 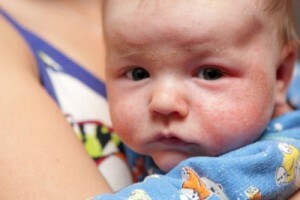 Which means that parents may be more aware of rashes and other symptoms that could resemble an allergy. Or they could simply be stating a personal opinion since the CDC did not check medical records or ask if a doctor had made the diagnosis. “We see a lot of kids in clinic that really aren’t” allergic to the foods their parents worry about, Dr. Morton Galina, a pediatric allergist at Atlanta’s Emory School of Medicine told Yahoo News. For example, hives that could be blamed on certain foods could actually be the result of a virus, Dr. Galina explained. But despite the possible misconceptions and mistakes in the report, experts say they believe that there really is an increase in skin and food allergies among children. And school nurses say they are also seeing an increase. Duties like banning peanuts at school parties and stocking emergency allergy medicines have been commonplace for the busy nurses. One such nurse, Sally Schoessler, says that, when she started school as a nurse in 1992 in New York State, she didn’t encounter even one child with a food allergy. And that was over the course of a few years. But when she left nursing school in 2005, “there were children in the majority of classrooms” with food allergies, Schoessler, who now works at the National Association of School Nurses in Silver Spring, MD, told Yahoo News. As for why the increase is happening, no one really knows. There are several speculations, but Dr. Peter Lio, a Northwestern University pediatric dermatologist who specializes in eczema says there’s no evidence to back up some of these speculations, however. For example, there’s no scientific evidence to back up the hypothesis that changes to the way foods are grown and produced (antibiotics used in cattle, crossbreeding of wheat, etc.) are responsible. But for other speculations, there is some evidence that could point to a possible reason. For example, some speculate that America’s addiction to disinfection and antibiotics may be responsible. Reports that have shown lower rates of eczema and food allergies in foreign-born children in the U.S. could be used to support this theory. And some reports have found that there are higher rates of childhood allergies in big cities, which could point to air pollutants as being the culprit. Still, there’s another possible cause behind the increase. Researchers say that parents who had a history of eczema and food allergies were encouraged to wait a few years before introducing foods tied to severe allergies, like peanuts, milk and eggs. But that advice was changed a few years ago by professional associations after researchers found that allergies were actually more likely in children when the foods were delayed. The old advice “was exactly the wrong thing to do,” and it could have actually contributed to some of the case increases, Galina said. In addition to the increase information, the CDC found that food and respiratory allergies were more common in higher-income families, but eczema and skin allergies were more common among the poor. Additionally, African-American children were most likely to have skin problems (17 percent), followed by Caucasian children (10 percent) and Hispanic children (10 percent). Renee Dantzler, the mother of a 13-year-old African-American girl, says that about half of the families in the eczema support group she runs are African-American. Her daughter, Jasmine, started getting rashes at 6 months of age, and they continued to get worse until she’d reached age 4. She said that her daughter had been so self-conscious about the scarred, whitened skin from her eczema that she’d worn long sleeves and pants, even in the summer. About four years ago, her daughter started using steroid creams and other treatments to improve her condition, and as it has gotten better, Jasmine has been less concerned about her appearance. But even with the healing – both physically and psychologically, Jasmine wears long socks while running track. “She’s the only one on the team with long socks,” Renee said.